- A/D conversion speed：20 times/second. - Internal resolution 1/ 300,000. 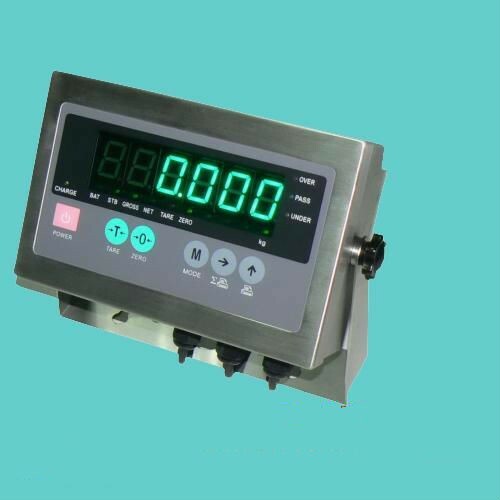 - Display resolution ：1/1000～1/30,000 division. - Excitation Voltage：＋DC5V，Analog (up to 4 x 350Ω load cell) . - Power supply：DC6V/4Ah re-charge battery or AC230V power supply. - Display：6 digits LED display and height 25mm LED. - LED indicate ：G.W., N.W., tare, zero, ct, oz, lb, kg. - Operating temperature：0 ~ 40 . - Dimension：230mm × 145mm × 98mm. Display the gross weight . Display value show net weight after deduct the container from the platter. Displayed weight is in Kilogram (Kg). Displayed weight is in Pounds (lb). Displayed weight is in Ounce (Oz). Displayed weight is in Carat (Ct). 1. When turn to Red LED show battery is LOW . 2. When turn to Green LED show battery is full . The weight is over the preset value. The weight is between Hi & Lo preset value. The weight is under the preset value.